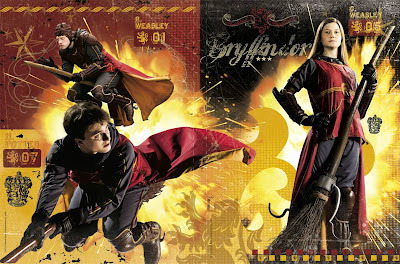 OK, what are you all wearing to the HP premier? Not much time left! K wants to be Ginny in her new Seeker uniform, and I haven't even started. I've seen one picture, but I haven't even started thinking about how to pull it off. And I will only have one short week to do it! The shirt, pants and pinny are no big deal, but the pads, gloves and boots! Oh my! 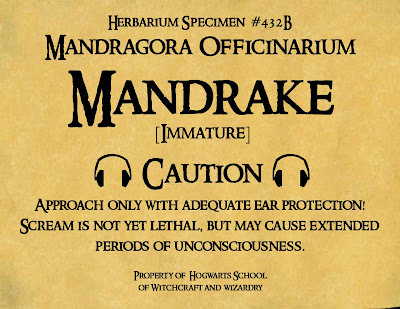 I got a comment asking for the Mandrake pot label, so I know someone is thinking of being a mandrake or at least making one. Wonderful! Here it is! The label is also available in my original Mandrake costume post, and I have put it on Fickr, under Mandrake pot label. And just so it isn't lost, I'll send it to the crafts section of the Leaky Lounge. Have fun and please leave me a comment with a link to a picture! I would love to see your costume! I was thinking of being Professor Sprout and making a pot to carry around. But the time is so short. Might just have to be Trelawny again. Fits my personality and it's quite fun. Especially the hair. Mr. Man makes a great Lupin, so I might go for Tonks, the pink would cover the grey. Though I prefer purple to pink. I'm excited to see what you come up with for the pads and all! Definitely post it when you find time after all the excitement is over!! !